8.5" x 11" x .002"
8.5" x 11" x .001"
Ideal for the broad evangelization of your neighborhood. Brighten any home or office with these cheerful scenes from God's creation. You may have noticed the carefully chosen gospel verses in the images above. They show many of the different aspects of God’s work of salvation including the need of the sinner, the love of God, the blood of Christ and the resurrection as well. Each is set in clear, readable type for easy viewing even from a reasonable distance. Small month pads help the user to review the previous month and preview the coming month. Users have a small amount of room for writing down appointments. 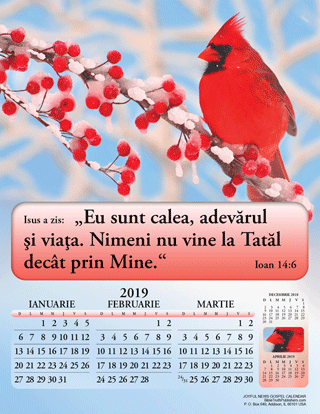 If you want a calendar with lots of space to write appointments and the ability to do extensive customization, then you might consider our Gospel of Peace Appointment Calendar.